The first step in designing my mom’s 1940s-style, no-special-orders, black-and-white bathroom was to find the wall and floor tile. Then, we searched for the liner tiles. 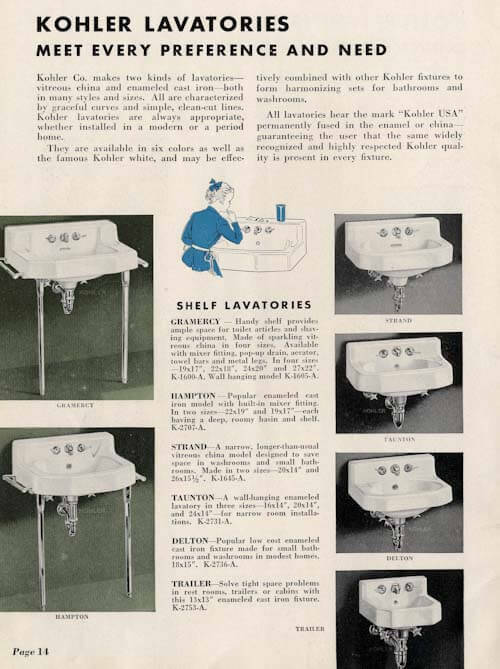 Once these decisions were made, my Aunt Mary Anne and I went shopping for the next “foundational” item: The bathroom vanity. In one day in Elizabethtown, Kentucky, we hit: Mouser’s Cabinets, their nearby outlet, Home Depot and Lowes. Somewhere along the way: Lunch at Panera. 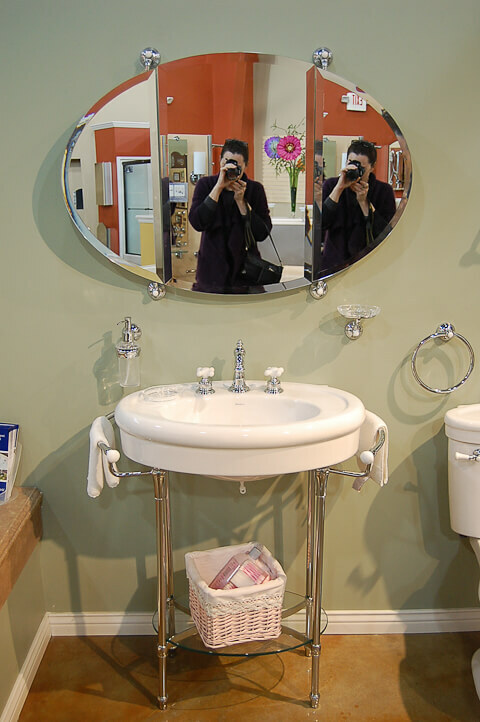 We did not find “the perfect” vanity. But we got close enough. 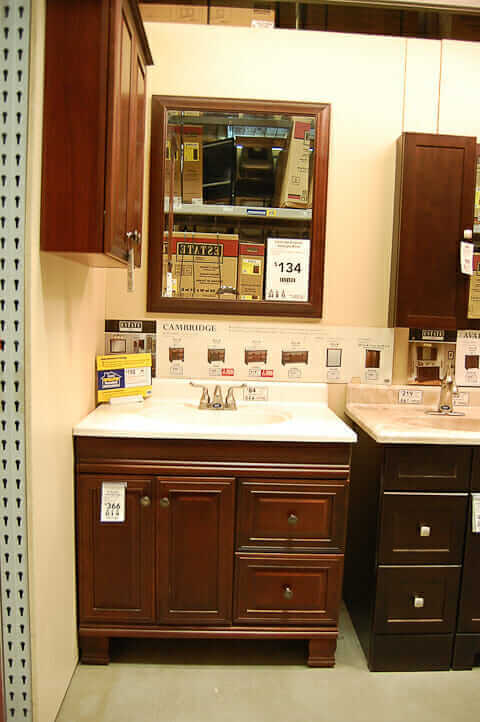 I had actually done some scouring the night before, after (1) meeting with the contractor at Mom’s house, (2) going to Louisville Tile to find in-stock floor and wall tile, (3) checking out a bathroom store next door, (4) running back to see Mom to finalize the tile choice, and then (5) going to Lowes and Home Depot to scope the choices for liner tile and in general, check out the bathroom department for Everything. 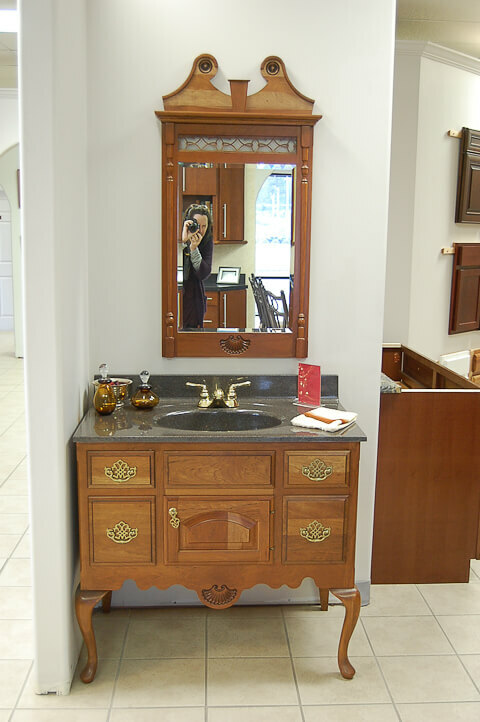 At the place next to Louisville Tile — I think it was called Master Bath — I saw this vanity from American Standard, and I thought it would be great — but it was too small. 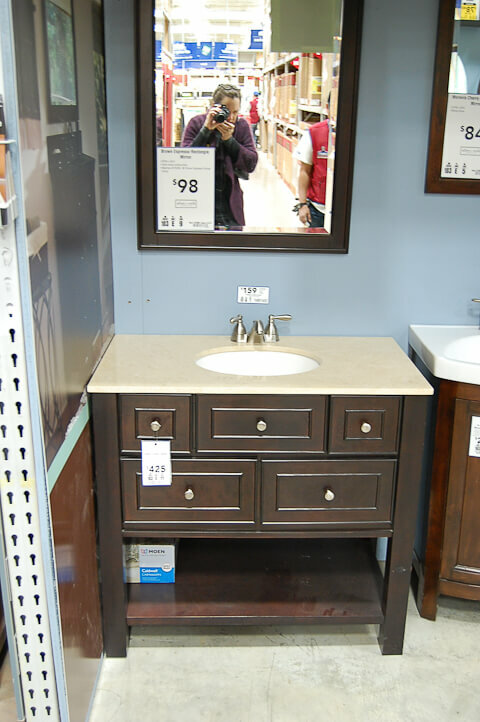 Mom had room for a 36″ vanity, and I wanted to use the space. The rest of the bathroom is very compact…. 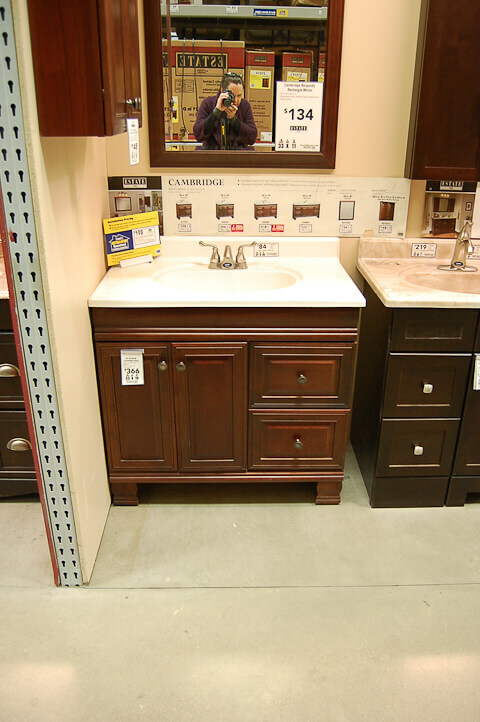 just about 6′ more against the wet wall… so I we needed the vanity storage space and also, the countertop space. Right off the top, I thought that a white vanity would be the way to go. Countertop: Black or Carrera-esque. 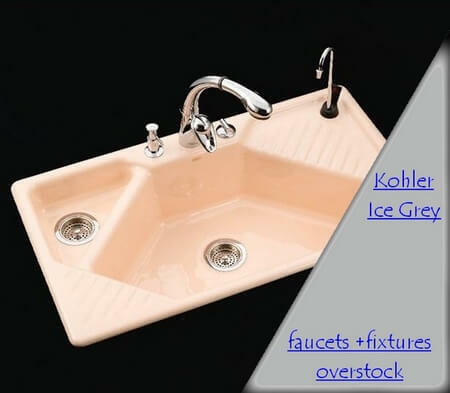 Here’s another American Standard sink from the same series. Again, I liked the idea a lot — but too small, no storage. Took a photo anyway. 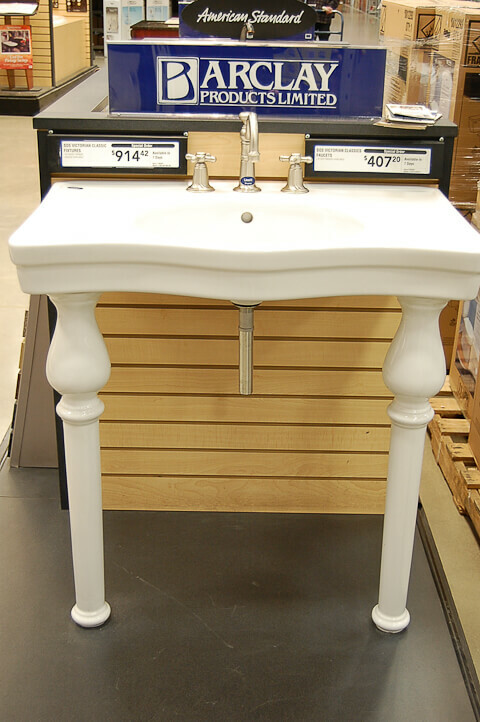 That same day, when I was shopping for liner tiles, I saw this lovely sink at Lowe’s. I thought it would be fabulous to use — aesthetically, it would be stunning. But, no vanity storage area…. And it was special order. So no go. Same day, Lowes. Hmmm. Maybe. But maybe not. Hmmm. Oh yeah. I meant to mention that I like the idea of something on legs, where you could see our pretty hex white with black dot floor. 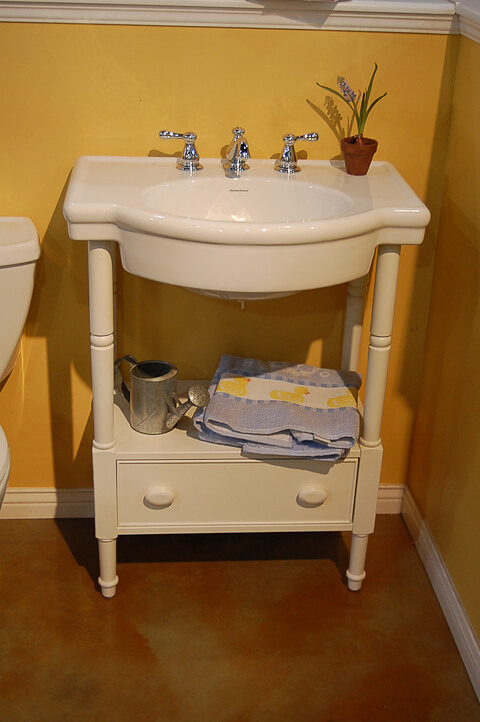 This is simpler than the vanity just before… But, it’s the wrong color. I was wanting white. Well, here we have white. I’m not so crazy about the door style. Too too. And, I wish there was no kickplate and this was just on legs. By now I’m just taking pictures of everything… and also beginning to think about buying something and repainting it. I like this idea. 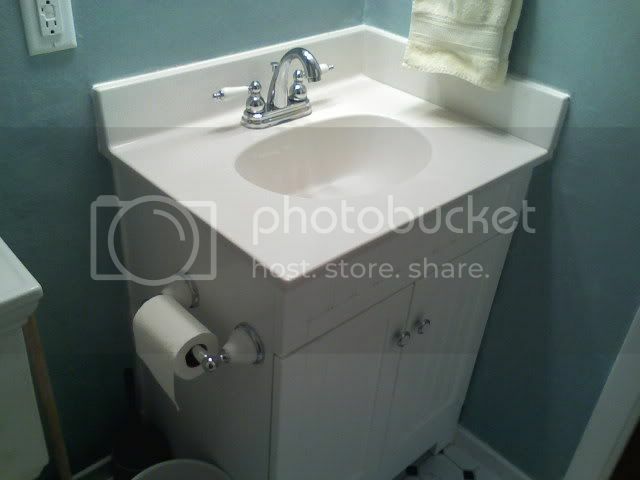 But, it seems maybe too modern… and honestly, I think that towels just tucked on that bottom shelf will just get dusty. 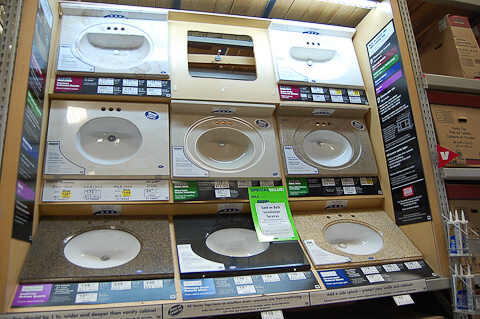 In the next aisle, I see all the sink choices. 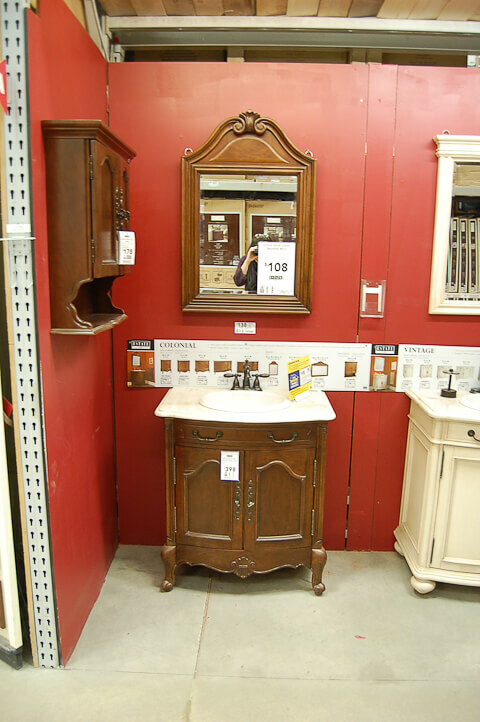 Like all the vanities on display, these are all in stock. I am very impressed by Lowes. 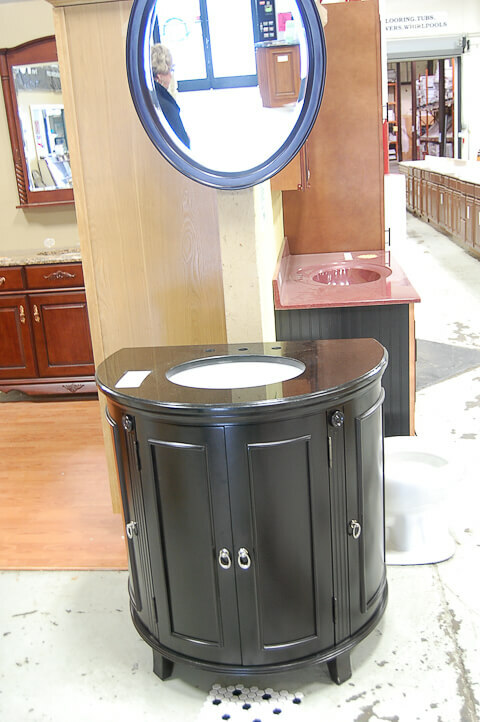 Black granite vanity sink with white undermount sink and black granite backsplash, predrilled for 8″ spread, for $198. Wow. There is only one in stock. I talk to the Lowes guy in the department. I have him put my name on it to hold and write me up a ticket. 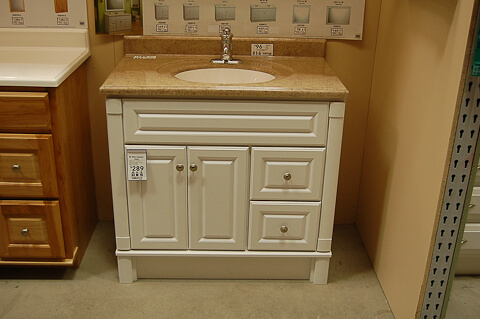 I am buying a granite bathroom vanity countertop to put on a white vanity (I am just not sure which one yet.) Mark this day: 50s Pam is buying some granite! 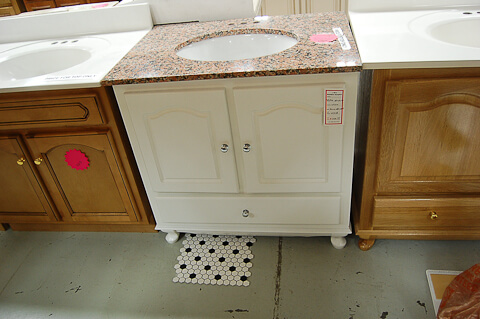 I take some more photos of vanities. I get braver about possible styles. This one has cute ball feet. And it reads “vintage”…. This one, too… cute little feet. We’s for sure see the cute little floor underneath…. Cottage style. 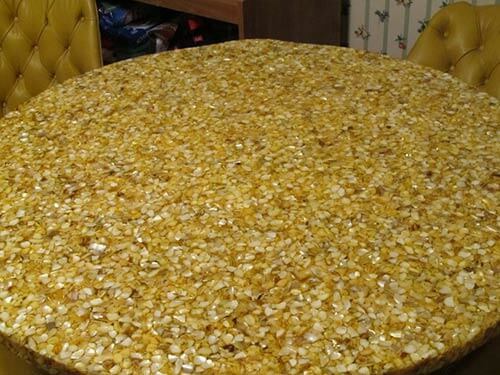 Mom would like this — she has beadboard in the kitchen. But, I’m thinking, the beadboard would bring too many lines into the bathroom. I would get dizzy what with the hexes underneath and the subways over yonder. This wraps up my first scan of the local Lowe’s and Home Depot, which I completed on my very first day of my product search (same day as I scoped the wall, floor and decorative tile. 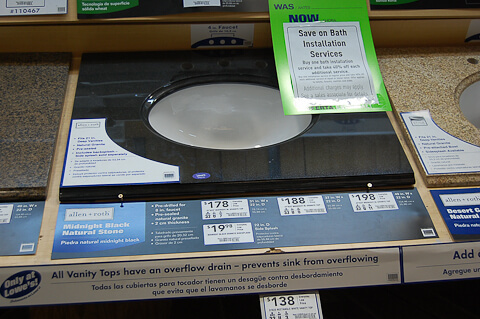 All the images above are from Lowes — which was really really impressive in their selection and their customer service. Home Depot, on the other hand, was quite disappointing. I found zero vanities to consider there — although they did provide me with the black rope tiles I wanted. So this is where the second trip out — this time with Aunt Mary Anne — starts. We spot this cutie petutie at Mousers. 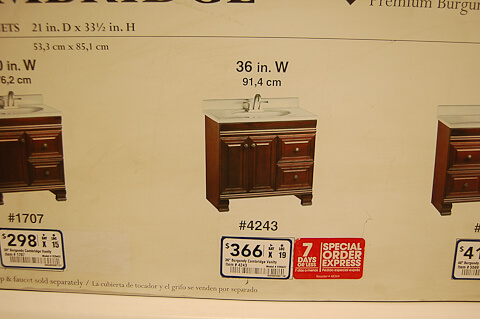 But, it’s way more expensive… the legs would bump into the wall at the left (we need to fit the vanity right into the wall to the left), and one of the drawers is sticky anyway, which makes the price ridiculous. We head over to the discount place. We find this thermofoil number and think it might work. But then, we don’t like the look of the thermofoil. We are underwhelmed. If we “have to”, we might buy it…. On the way out we spot this number. Hey, it’s kind of cut. The roundness might actuall make the bathroom feel bigger. Moreover, we kind of LIKE the way the black vanity looks against the tile. Aunt Mary Anne tells me she’s been thinking about black … We are both ALL OVER THE BLACK. This is a big turning point. We are getting a black vanity! We might get this one. But we head over to Home Depot and Lowe’s — a return trip to me, my first trip with Aunt Mary Anne, and today, we MUST buy something. 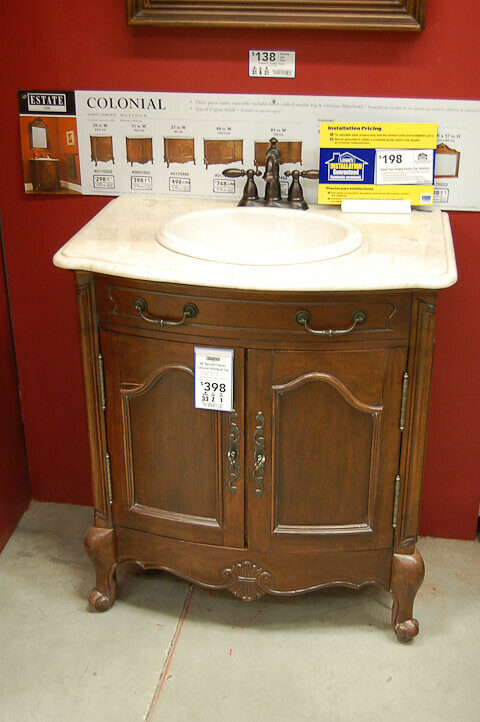 At Lowe’s, we look at all the choices I’ve already showed… and end up thinking: We want this one, it is curvy and cute and has legs. I will paint in black and we’ll put the white Lowe’s countertop on it. We are very excited. 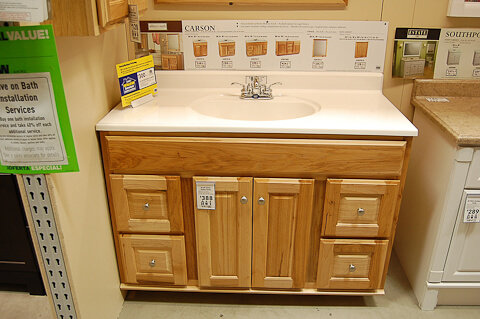 Note: We decide against the rounded one at the discount store because the left-hand door won’t really open because it’s butted up to a wall… plus, we think we want the greater storage we’ll get from a rectangular vanity. But not so fast. Agony. 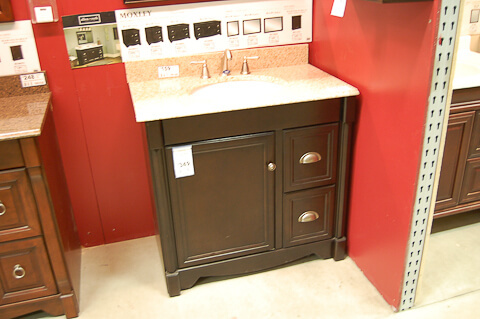 Because this vanity comes with the curvy top and sink on it. The helpful Lowe’s employee calls the department manager for us to discuss whether the $98 white countertop can be fit on it. Nope. It will not work. A case of no square peg in round hole. Darnit. I have to admit, I am stymied about of the other designs to settle for. I am tired, as I already was shopping for like 16 hours for the tile the day before. But Aunt Mary Anne stands and stares and walks and stares and thinks and stares and within about 10 minutes, says, we want this one. I think: Okay, let’s buy it. Note: I had paid for the black granite countertop the night before. So we move the “hold” ticket to the white countertop instead – and when we check out, I get a refund for one and pay for the other. So: Unmark this day. 50s Pam did not buy granite. That said: Could there be some Greige in my near future???? Basically, our vaniety will look like this 36″ model shown here… Except, I will paint it black and change out the hardware. 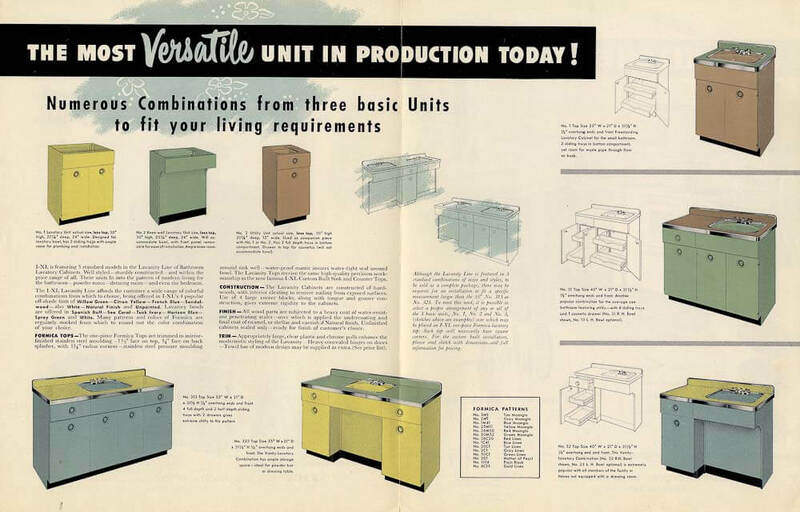 In fact, I get the idea to ask the nice folks at Rustoleum — who invited me to test their Rustoleum Cabinet Transformations DIY painting system earlier this year — whether they would like to “sponsor” the repainting of my Mom’s bathroom vanity and send me a kit. A quick email and they say: Heck yes — and they send me a voucher for the kit right away. I’ve now repainted the vanity using the Rustoleum cabinet painting kit and will show off the final result in the big reveal. I’ll also do a separate post on my painting project. Thank you, Rustoleum, for your helping renovate Mom’s bathroom! So that is the “buy it from stock, no special orders” bathroom vanity saga. Seeking decorating perfection is exhausting, isn’t it? There’s more detail-obsession on a Tazmanian-devil timeline yet to come. This is making me hyperventilate! A bathroom in 7 days?! Ours took over a year! Wow, I can’t believe you are adding painting the vanity to the list! Yikes! 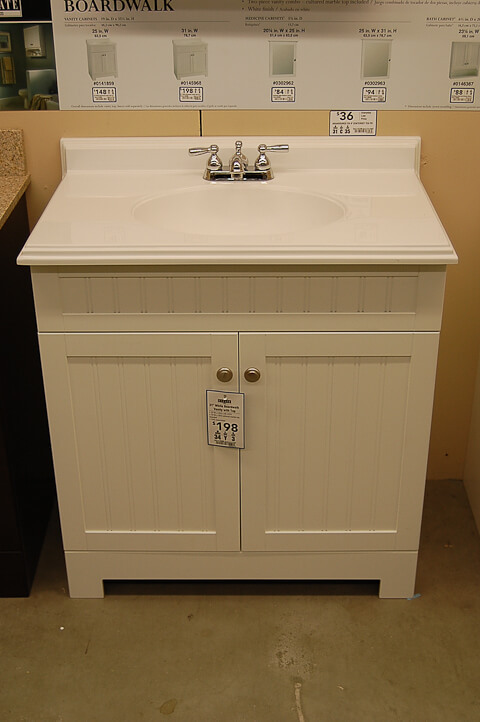 We have a smaller version of the white beadboard vanity in our hall bath. We ordered a cultured marble top from Lowe’s to replace the standard one that came with it because it would not work in a corner as well. Of course ,you have no time for a special order. Little did I know cultured marble was more period correct. 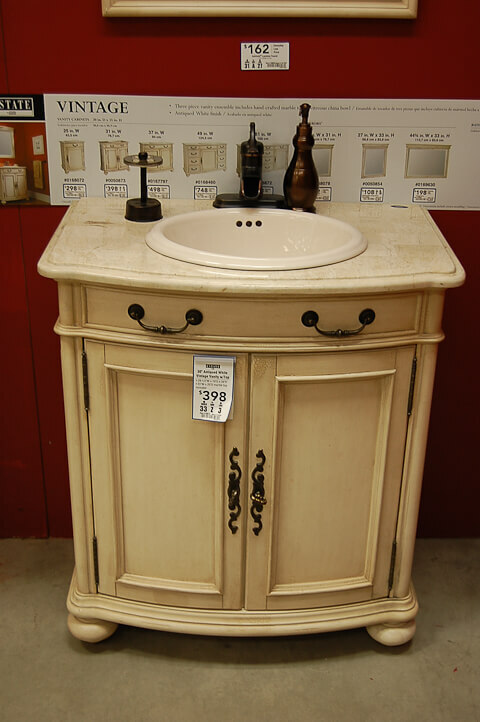 Which “discount” store did you find that cute round vanity? I’m looking at doing a similar bathroom in my streamline moderne house and think that one might be just right for us! Thanks for the ideas. Pam – We just bought the white cottagey one. We are going to paint the door outlines dark green and run a light green stripe along the bead part of the bead board. These are the colors of the floor and wall tiles. We think it will come out retro-wickery. We could not do any of that heavy dark brown stuff available these days. Sounds great! 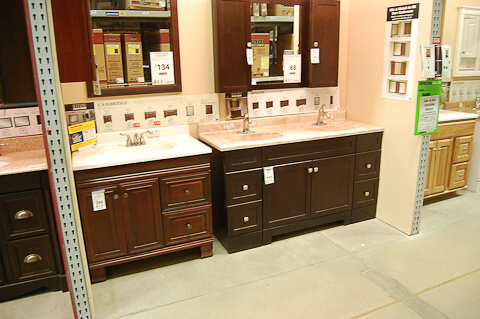 I think the Lowes vanities are pretty nice! Take lots of pics!